Vitamin E Might Help Slow Alzheimer's Early On : Shots - Health News Vitamin E has gotten a bad rap because of studies finding it increases risk of death. But people with early-stage Alzheimer's disease might be able to fend off symptoms for a while, a study finds. That could mean more a little more time to live independently, and less burden on caregivers. Alzheimer's is a disease without a cure, and the available treatments only slow its progression for a bit. 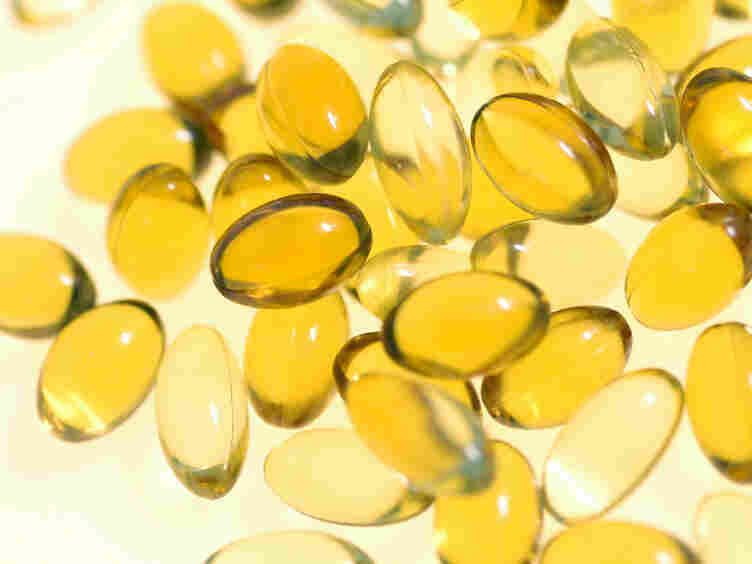 Now there's evidence vitamin E may help hold it at bay, at least for people in the early stages of the disease. The finding, though inconclusive, is a bit of a surprise. Vitamin E has gotten a bad rap in recent years. A 2005 study found that taking high doses of vitamin E increased the risk of death, and other studies have shown no benefit in preventing cancer or heart disease. And vitamin E hasn't been shown to improve thinking in people with no memory problems, or to slow progression to Alzheimer's in people mild cognitive impairment. But this study found that people with mild to moderate Alzheimer's disease who took big doses of vitamin E had slower functional declines. That slowing effect translates into a delay in progression of about 6 months over an average of two years. The people who took vitamin E were better able to do things like dress themselves, and reduced the amount of caregiver help they needed by about 2 hours a day. The study, which was published Tuesday in JAMA, the journal of the American Medical Association, found that the people taking vitamin E also did better than people taking a placebo or Namenda, called memantine generically, a drug used to treat symptoms of advanced Alzheimer's. "We are more optimistic," says Dr. Maurice Dysken, a researcher with the Minneapolis VA Health Care System, who led the study. Dysken and his colleagues used to prescribe 2,000 international units of vitamin E to Alzheimer's patients, based on a 1997 study that showed that it helped delay progression of symptoms. But the 2005 meta-analysis that showed higher death rates in people who took more than 400 IU a day dampened their enthusiasm, Dysken tells Shots. "We were very aware of that when we started this trial." The group of people in this study taking vitamin E had a slightly lower death rate than the placebo group, but the number of participants, 613 patients at 14 Veterans Affairs medical facilities around the country, was too small to prove that's really true. It would take thousands of patients to figure that out. And other puzzles remain. Some of the people in the study were taking memantine along with vitamin E, and they didn't see the benefits in the people taking vitamin E alone. Dysken says he and his colleagues don't know why. They also don't know why vitamin E, which is an antioxidant, might help in the early stages of Alzheimer's, but not later on. Some people think that vitamin E enhances the effect of other Alzheimer's drugs like Aricept, but this study doesn't prove that. But Dysken can see a real benefit for slowing the march of the disease early on. "I think it would be particularly meaningful for patients in the mild to moderate group," Dysken says. "Patients who are at the end of the illness, no one thinks slowing the rate of decline means anything if a patient is six months from going into hospice. But earlier in the disease it can be a meaningful difference." Lots more work needs to be done to see if this apparent benefit is real, according to both Dysken and an editorial accompanying the study. And Dysken cautions that Alzheimer's patients should be given vitamin E only under a doctor's supervision.